We cannot honor the Creator without cherishing the sacredness of every person and of every human life: each person is equally precious in the eyes of God, who does not look upon the human family with a preferential gaze that excludes, but with a benevolent gaze that includes. Thus, to recognize the same rights for every human being is to glorify the name of God on earth. In the name of God the Creator, therefore, every form of violence must be condemned without hesitation, because we gravely profane God’s name when we use it to justify hatred and violence against a brother or sister. No violence can be justified in the name of religion. The enemy of fraternity is an individualism which translates into the desire to affirm oneself and one’s own group above others. This danger threatens all aspects of life, even the highest innate prerogative of man, that is, the openness to the transcendent and to religious piety. True religious piety consists in loving God with all one’s heart and one’s neighbor as oneself. Religious behavior, therefore, needs continually to be purified from the recurrent temptation to judge others as enemies and adversaries. Each belief system is called to overcome the divide between friends and enemies, in order to take up the perspective of heaven, which embraces persons without privilege or discrimination. A fraternal living together, founded on education and justice; a human development built upon a welcoming inclusion and on the rights of all: these are the seeds of peace which the world’s religions are called to help flourish. For them, perhaps as never before, in this delicate historical situation, it is a task that can no longer be postponed: to contribute actively to demilitarizing the human heart. The arms race, the extension of its zones of influence, the aggressive policies to the detriment of others will never bring stability. War cannot create anything but misery, weapons bring nothing but death! None of this is permitted for a Roman Catholic to hold. Francis' Brilliant Plan for World Peace: Ban All Weapons! In the first Encyclical Letter [Ubi Arcano Dei] which We addressed at the beginning of Our Pontificate to the Bishops of the universal Church, We referred to the chief causes of the difficulties under which mankind was laboring. And We remember saying that these manifold evils in the world were due to the fact that the majority of men had thrust Jesus Christ and his holy law out of their lives; that these had no place either in private affairs or in politics: and we said further, that as long as individuals and states refused to submit to the rule of our Savior, there would be no really hopeful prospect of a lasting peace among nations. Men must look for the peace of Christ in the Kingdom of Christ; and that We promised to do as far as lay in Our power. In the Kingdom of Christ, that is, it seemed to Us that peace could not be more effectually restored nor fixed upon a firmer basis than through the restoration of the Empire of Our Lord. We were led in the meantime to indulge the hope of a brighter future at the sight of a more widespread and keener interest evinced in Christ and his Church, the one Source of Salvation, a sign that men who had formerly spurned the rule of our Redeemer and had exiled themselves from his kingdom were preparing, and even hastening, to return to the duty of obedience. The reason why only the peace of Christ is genuine and true peace, and why it cannot be obtained in any other way except by submitting to the sweet yoke of His law and Gospel (cf. Mt 11:30), is that divine grace is needed to aid us in our human condition, to overcome our sins, perfect our nature, and make us virtuous so that we may bear wrongs patiently, forgive our enemies, and do good to those who hate us. So far, so good -- but that's because he hasn't said anything yet. Following our recent meeting in the Vatican, and in response to your thoughtful request, I would like to offer some considerations that, together with all the Pastors of the Catholic Church, I consider important in view of the forthcoming meeting of the G20, which will gather Heads of State and of Government of the Group of major world economies and the highest authorities of the European Union. So Francis is writing this message "in response to [Merkel's] thoughtful request"? Fair enough -- although we can be certain that Francis, being the unrivaled champion of unsolicited remarks, would have offered his profound counsel to the G20 regardless of whether anyone cared to hear about it. In doing so, I follow a tradition begun by Pope Benedict XVI in April 2009 on the occasion of the London G20. My Predecessor likewise wrote to Your Excellency in 2006, when Germany held the presidency of the European Union and the G8. In the first place, I wish to express to you, and to the leaders assembled in Hamburg, my appreciation for the efforts being made to ensure the governability and stability of the world economy, especially with regard to financial markets, trade, fiscal problems and, more generally, a more inclusive and sustainable global economic growth (cf. G20 Leaders Communiqué, Hangzhou Summit, 5 September 2016). As is evident from the Summit’s programme, such efforts are inseparable from the need to address ongoing conflicts and the worldwide problem of migrations. 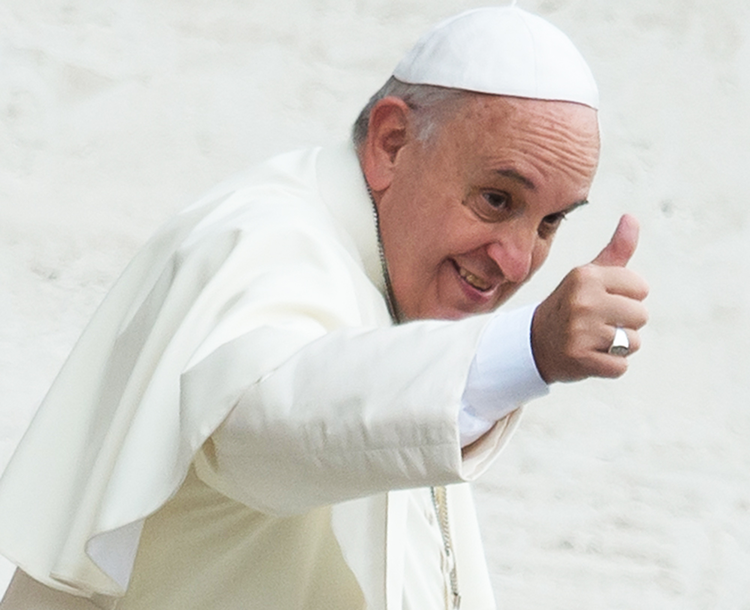 In my Apostolic Exhortation Evangelii Gaudium, the programmatic document of my Pontificate addressed to the Catholic faithful, I proposed four principles of action for the building of fraternal, just and peaceful societies: time is greater than space; unity prevails over conflict; realities are more important than ideas; and the whole is greater than the part. These lines of action are evidently part of the age-old wisdom of all humanity; I believe that they can also serve as an aid to reflection for the Hamburg meeting and for the assessment of its outcome. Time is greater than space. The gravity, complexity and interconnection of world problems is such that there can be no immediate and completely satisfying solutions. Sadly, the migration crisis, which is inseparable from the issue of poverty and exacerbated by armed conflicts, is proof of this. It is possible, though, to set in motion processes that can offer solutions that are progressive and not traumatic, and which can lead in relatively short order to free circulation and to a settlement of persons that would be to the advantage of all. Nonetheless, this tension between space and time, between limit and fullness, requires an exactly contrary movement in the minds of government leaders and the powerful. An effective solution, necessarily spread over time, will be possible only if the final objective of the process is clearly present in its planning. In the minds and hearts of government leaders, and at every phase of the enactment of political measures, there is a need to give absolute priority to the poor, refugees, the suffering, evacuees and the excluded, without distinction of nation, race, religion or culture, and to reject armed conflicts. At this point, I cannot fail to address to the Heads of State and of Government of the G20, and to the entire world community, a heartfelt appeal for the tragic situation in South Sudan, the Lake Chad basin, the Horn of Africa and Yemen, where thirty million people are lacking the food and water needed to survive. A commitment to meet these situations with urgency and to provide immediately support to those peoples will be a sign of the seriousness and sincerity of the mid-term commitment to reforming the world economy and a guarantee of its sound development. Unity prevails over conflict. The history of humanity, in our own day too, presents us with a vast panorama of current and potential conflicts. War, however, is never a solution. As the hundredth anniversary of Pope Benedict XV’s Letterto the Leaders of the Warring Peoples draws near, I feel bound to ask that the world put an end to all these “useless slaughters”. The goal of the G20 and of other similar annual meetings is to resolve economic differences peacefully and to agree on common financial and trade rules to allow for the integral development of all, in order to implement the 2030 Agenda and the Sustainable Development Goals (cf. Communiqué of the G20 Hangzhou Summit). Yet that will not be possible unless all parties commit themselves to substantially reducing levels of conflict, halting the present arms race and renouncing direct or indirect involvement in conflicts, as well as agreeing to discuss sincerely and transparently all their differences. There is a tragic contradiction and inconsistency in the apparent unity expressed in common forums on economic or social issues, and the acceptance, active or passive, of armed conflicts. Realities are more important than ideas. The fateful ideologies of the first half of the twentieth century have been replaced by new ideologies of absolute market autonomy and financial speculation (cf. Evangelii Gaudium, 56). In their tragic wake, these bring exclusion, waste and even death. The significant political and economic achievements of the past century, on the other hand, were always marked by a sound and prudent pragmatism, guided by the primacy of the human being and the attempt to integrate and coordinate diverse and at times opposed realities, on the basis of respect for each and every citizen. I pray to God that the Hamburg Summit may be illumined by the example of those European and world leaders who consistently gave pride of place to dialogue and the quest of common solutions: Schuman, De Gasperi, Adenauer, Monnet and so many others. The whole is greater than the part. Problems need to be resolved concretely and with due attention to their specificity, but such solutions, to be lasting, cannot neglect a broader vision. They must likewise consider eventual repercussions on all countries and their citizens, while respecting the views and opinions of the latter. Here I would repeat the warning that Benedict XVI addressed to the G20 London Summit in 2009. While it is reasonable that G20 Summits should be limited to the small number of countries that represent 90% of the production of wealth and services worldwide, this very situation must prompt the participants to a profound reflection. Those states and individuals whose voice is weakest on the world political scene are precisely the ones who suffer most from the harmful effects of economic crises for which they bear little or no responsibility. This great majority, which in economic terms counts for only 10% of the whole, is the portion of humanity that has the greatest potential to contribute to the progress of everyone. Consequently, there is need to make constant reference to the United Nations, its programmes and associated agencies, and regional organizations, to respect and honour international treaties, and to continue promoting a multilateral approach, so that solutions can be truly universal and lasting, for the benefit of all (cf. Benedict XVI, Letter to the Honourable Gordon Brown, 30 March 2009). Here Captain Obvious speaks again: "The whole is greater than the part." Every child who has ever had to share a candy bar could have told you as much. Exactly how this brilliant observation relates to the text that follows it, however, will have to remain a mystery. What do you know, even the word "God" makes two brief appearances in the 1224-word "pontifical" message. In neither case, however, is there a reference to God's Kingdom, His laws, His Church, or the purpose for which He created human life. Rather, in both cases God is merely invoked to lend some solemnity to the whole thing and remind Mrs. Merkel that what she's reading is a message from the "Pope" and not from the U.N. Secretary General -- since this is no longer evident from the content alone. We have said this time and again: In Bergoglio's religion, God is merely a bandaid to be applied as needed, usually to solve people's problems, forgive their sins, and make them feel good. Other than that, Bergoglio has no use for God. He believes in man and the religion of man, just as St. Pius X warned over 100 years ago when he denounced that "enormous and detestable wickedness, so characteristic of our time -- the substitution of man for God" (Pope Pius X, Apostolic Letter Notre Charge Apostolique, n. 9). Francis is happy to lead by example. In addition to joining his imam friend Ahamad Al-Tayyib to sign an outrageous document that blatantly promotes apostasy, “Pope” Francis (Jorge Bergoglio) also gave a speech at the so-called Global Conference of Human Fraternity in Abu Dhabi, United Arab Emirates, on Feb. 4. The logo of this journey depicts a dove with an olive branch. Francis’ Brilliant Plan for World Peace: Ban All Weapons! With idiotic content this like being the real news coming from Vatican City, there is nothing left to do for the satirists and parodists at Eye of the Tiber. One need not possess the charism of infallibility to be able to predict that no matter what happens in the world, Francis will have something to say about it. In fact, one can say that never before Francis did a single man who had so little to say, talk so much. Thus it stood to reason that the “Pope” wasn’t going to let the world’s major economic powers meet for their annual G20 summit without butting in and gracing them with a few crumbs of his infinite wisdom: A few days ahead of the July 7-8 event in Hamburg, Germany, Francis had sent a message to the host nation’s chancellor, the Lutheran adulteress Angela Merkel.